On many secular issues, atheists and many theists have common interests. By working together on these issues, voices will be louder. While I am no longer religious, I absolutely support people's right to religious freedom. Unacceptable- 26 bishops are able to influence legislation which will directly affect me - for no other reason than they are connected to the established church. It's all very well suggesting Islamic faith schools are potentially damaging children, but the only way to solve this problem is to leave all religion out of education and legislation. I'm not anti-religion, but I am against giving any religion a free ride. I discovered the NSS while studying Politics at school, researching pressure groups. I was particularly interested in secularism, always held similar beliefs, and decided to join to promote the cause of religious freedom and equality. The treatment of religious minorities, atheists and apostates in theocratic countries is sickening. Everyone should have the right to their own beliefs and religious choices, provided that they do not impinge on other people's rights. Religious minorities, atheists and apostates are routinely treated appallingly in theocratic countries. Every human should be free to express their own thoughts, beliefs and religious choices, provided they do not impinge on other people's rights. "I believe in people's freedom to practise whatever religion they wish,provided it never interferes with the legal system and policy making, in vital services such as education, health. I support any action challenging religious organisations' campaigns to manipulate laws and services. I hope that my membership is enough to make a valid contribution to this important cause." 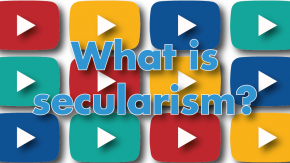 I feel secularism is a cause for which I can be politically and publicly active. Ultimately it's about removing the archaic rights given to religions to infringe my liberty. "Diagnosed with multiple sclerosis I have been thinking about my legacy and end of life issues. Assisted suicide is currently illegal in the UK, a policy which suffers from strong religious lobbying. Legislating against the wishes of a mentally competent person seems barbaric." Religion has had far too much privilege, power and protection for far too long. Humanity needs to evolve and the continued inclusion of superstitious beliefs in the affairs of state is not helping that process. 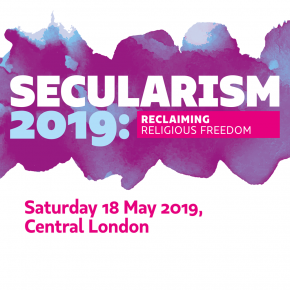 I have long been convinced that the only way to fight religious extremism, and protect basic liberties, is to work towards a properly secular and democratic society, in which freedom of religious practice and expression (within the law) is safeguarded. When selecting a school for my kid, I checked it wasn't focused towards just Christianity. I have no issues with schools teaching about religions and beliefs equally, but don't want my young and impressionable children to be exposed to evangelical practices. Baroness Warsi finally talked me into joining the Society. 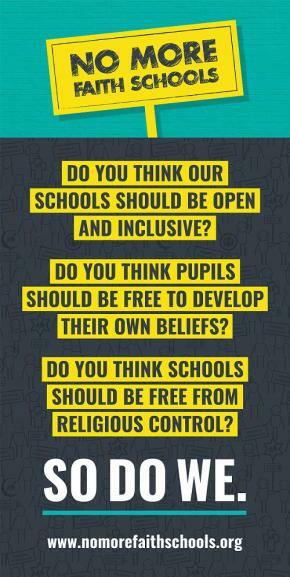 I am particularly concerned about faith schools. I express these views reasonably and do not see why they should be labelled 'strident' at the first opportunity. I am opposed to faith based schools on principle. The government promotes tribalism, the single greatest threat to our future. Many other threats can be solved if we work together and not against each other. We cannot, and should not, protect our country's children from being brought up by ultra-conservative religious parents but we can, and should, ensure that they go to a school where they learn about other religions, about humanism, about living without religion and are given the confidence that people of all faiths and none are treated equally under the law. I was delighted Ofqual had investigated the inexcusable redacting of exam questions, had ruled in favour of children's education, and the key role the NSS played in this outcome. Religious views should not be impressed upon others. We should not have religion involved in dictating law, meddling in politics and education. The General Principles of the NSS very accurately represent my outlook. Religious beliefs are valid and appropriate when held and practised privately, but if you use your beliefs to justify your actions, you must be prepared to justify your beliefs. "I am angry with what I view as the permitted brainwashing of children within our education system. Myself and my wife joined the NSS to help protect children from adults with religious and faith based agendas." We should not label our children as Christian, Muslim or any other religious group. So big NO to faith schools. The NSS is Britain's front line defence against the vested interests of organised religion that damage our public institutions, not least in education and local government. I feel proud my membership money will go towards future successes in the fight for a fair and secular future for all. What prompted me to join was simply that I had had enough of religious organisations establishing themselves as being above criticism. That it is not possible to criticise religious practices without being told that you are being offensive scares me.